Directions: Chew 1 gum after brushing teeth before bed. Chew for 5 minutes then discard. 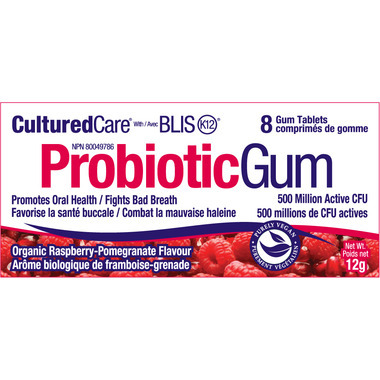 Ingredients: Medicinal ingredients: BLIS K12 probiotic (S.Salivarius) Non-medicinal Ingredients: Isomalt, gum base, organic natural flavours, xylitol, calcium stearate, malic acid, steviol glycosides. Contains no artificial flavours, colours, sweeteners or preservatives. Helps a lot with sore throats. My son used it for one week out of every month (chewing it once daily) and he has avoided getting strep throat which he had 4 times in a year! Love this gum! Flavour fades but the gum keeps your mouth fresh for hours. Helped my gums heal up. Great stuff! I think it may have helped clear up my tonsil stones. Kind of chalky taste at first and doesn't last long, but the label says to only chew it for 10 mins anyways.